On my drive from NC to FL, I stopped in at Merritt Island, near Titusville, FL to see what birds I might see in the Wildlife Reserve. 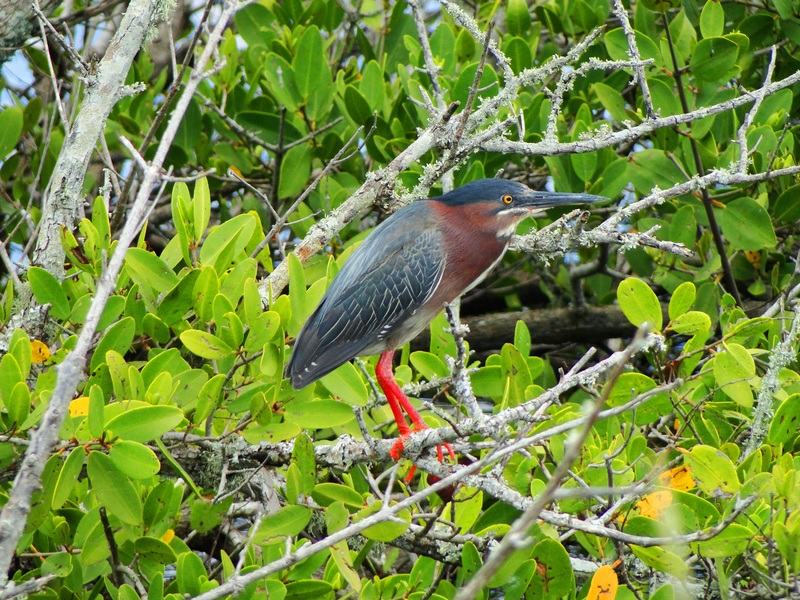 I was fortunate to come upon a handsome Green Heron resting in a short tree in the marsh. Another bird tried to enter his territory, but with the loud hissing and clacking, that wasn’t going to happen. He settled down quickly and allowed me to quietly get within about 8 ft. of him. I imagine he was protecting a nest in that tree for ’tis the season! The Green Herons are quite stately looking to me with the greenish grey upper feathers, a darker green-black top of the head, and the chocolate brown chest area. Their beak is long and stout and they are one of just a few large water birds that actually use their beak as a tool. The Green Heron will gather a “bait” of some sort in it’s beak and drop it onto the surface of the water…lake or pond, and wait for his “catch” to come up to eat it. His catch may, indeed, eat the bait, but the heron will eat IT!! Herons are smart, intuitive birds and live quietly among a variety of species…unless threatend. At that time, they take control and make it known they claim their spot! Fun and amusing to watch.